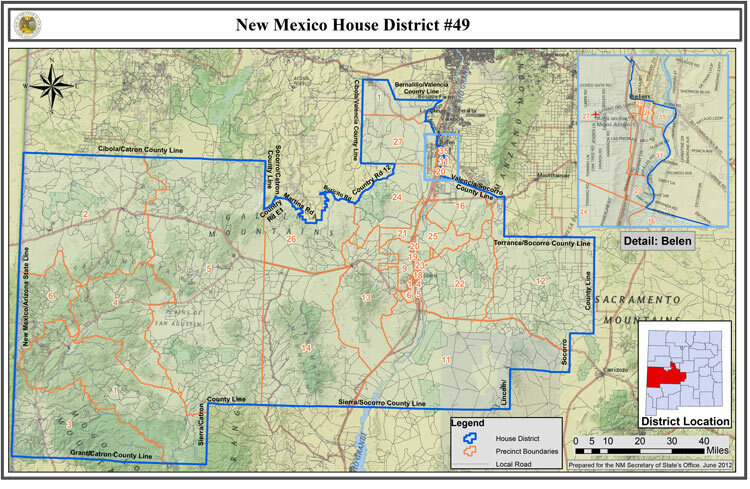 District 49 is the largest district in New Mexico. It covers a large area and includes 3 counties. I proudly represent beautiful District 49. The district is large and diverse with a range of cultural wealth from legendary ghost towns to the world renowned NM Tech, The Harvey House Museum to Willow Creek Campground, White Sands Missile Range to Pie Town, and the Very Large Array to the famous Catwalk. District 49 is helping to lead the nation’s technology industry and also offers some of the finest hunting, fishing, and camping in the state. I am blessed to represent such a distinct and varying area. It is my home where I was born and raised, and I want what is best for District 49 and New Mexico.